Hello everyone! The snow is a comin' here in the Shenandoah. The grocery store was a zoo yesterday and I can only imagine what it will be like today. I ran to my LNS (40 mins away) yesterday to get some threads and fabric. I think I will be finished with Sara by tomorrow and I wanted to get started on a new project. So I bought threads and fabric for TWO new projects. Sorry, I could not help myself! I have joined the Beatrix Potter SAL and want to get started ASAP and I needed the fabric and threads. The called for fabric is Antique White and I decided to go with a different color thread than the original (which I believe is a reddish color.) I have been stitching with a lot of browns, reds, greys, pinks lately and I was drawn to this gorgeous teal-y color called Bretheren Blue (GAST.) I love the color but it is a bit dark so I am going to rinse the threads first and hopefully get rid of any residual dye that may bleed onto the fabric. Here's hoping! I don't plan to stitch on Bea more than a day or two a week so my other new project will be "Family Record Sampler" by Hester's Needle (another hubby present.) Here are two pics...sorry about the lighting it is dark outside due to the impending snow. I wanted to change the called for colors, A LOT. My idea was to use the colors of the dogwood tree, pinks, white, green and brown since I am going to stitch my grandmother's family (father, mother, brother and sisters) and the dogwood is my grandmother's favorite! But the lady at the LNS said that it might be better if I went monochromatic and stuck with one color. At the time, I liked the idea since I plan on stitching this piece more than once. So, I chose a bright raspberry color and natural linen. As she was cutting the linen, I saw another color that I just had to have, Berry Patch (Cresent Colors.) It was perfect since it looked just like the colors of my great-grandmother's rose bush. However, at first I thought the fabric was too dark, but when I put the threads with lighter fabric I like the darker better. What do you think? Does the rose show up against the Natural fabric? Any suggestions or comments would be appreciated! As time has passed, I am also leaning towards not using only one color. I think that I am going to introduce a green for the flower vine, a darker and lighter rose for depth. Still, I am going to stitch what I can in this color first. Another trip to the LNS just for thread never ends up being just for thread! 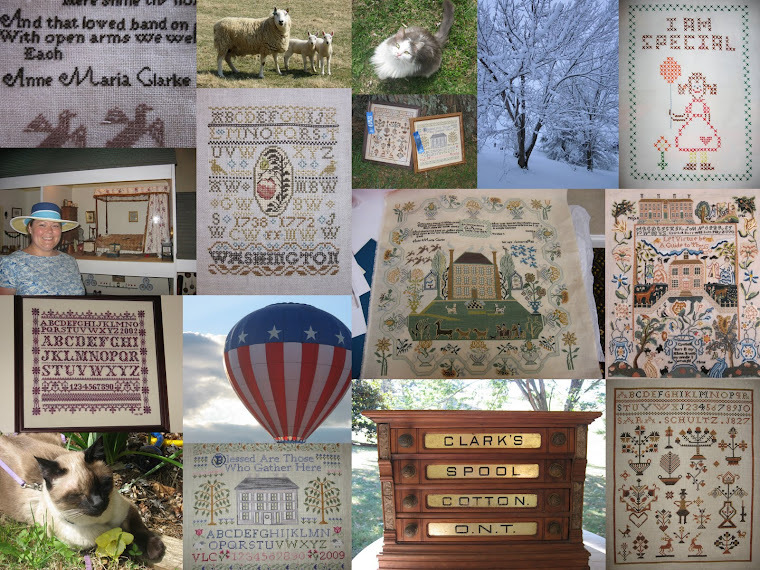 Besides, I gotta save money for my trip to Williamsburg and the Gathering of Embroiderers! Well everyone, thanks for stopping by! I adore reading everyone's comments and appreciate your taking the time to visit. I plan on finishing Sara today or tomorrow, so you will be hearing from me soon! Happy Stitching! I think the Wild Berries is going to show up on the linen just fine. That shade is a red that I have fell in love with recently . I like the family record sampler too! The GAST Brethern Blue is a lovely colour and will be so nice for Beatrix. I like the threads with this fabric and if you do introduce some other colours I think it will still work. Looking forward to hearing that Sara is a finish. Stay warm!